Millimeter-size marine organisms called foraminifera have been used to monitor pollutants in marshes and oceans, and could help to assess recovery in the Gulf of Mexico following the three-month long Deepwater Horizon oil spill. That was the message from a French/American team of researchers who recently reported on the health of French marshes and mudflats 32 years after the Amoco Cadiz spilled 220,000 tons of oil along the Brittany coast in 1978. The results were presented Sept. 7 by Lipps’ colleague, Marie-Thérèse Vénec-Peyré of the Muséum National d’Histoire Naturelle in Paris, at the international Forams 2010 symposium in Bonn, Germany. The presentation was part of a session on Foraminifera as bioindicators of human impacts, and included discussion of “forams” as monitors of water quality along the Mediterranean coast, off Southern California, in Norwegian fjords and among atolls in the Pacific Ocean. In assessing the health of the ocean floor, on the other hand, foraminifera are so sensitive that “we can tell within an hour or two of when the sample comes up on the ship what the conditions are down below,” he said. 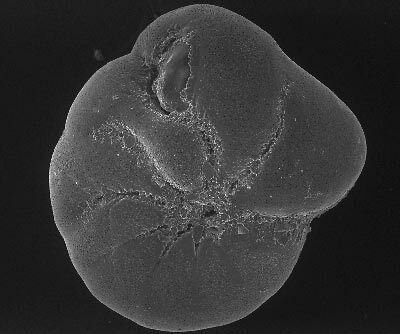 Lipps is applying for federal grants to develop foraminifera as indicators of oil pollution in the marine environment, in general, and in the Gulf, in particular. The foraminifera used in this study are pin-head size, single-celled protists that secrete a calcium carbonate shell, called a test, that remains on the ocean bottom after the organism dies. Fossilized forams have been used by the oil industry for decades to identify the age and ancient environments of rock deposits they drill through. What makes foraminifera so useful is that their shells deform in the presence of chemical pollution, including oil, and they have a very short life span — about 30 days. The rapid turnover means that living forams indicate the current state of pollution, while cores through sediment can reveal past history of pollution. The team’s test case was the Amoco Cadiz, an oil tanker that broke apart on the north coast of Brittany on March 16, 1978, eventually polluting 360 kilometers of coastal rocks, bays, marshes and estuaries, as well as offshore subsurface areas. Working in the Morlaix estuary, a site impacted by the spill, Vénec-Peyré in 1978 collected living foraminifera of the species Protoelphidium paralium eight months after the spill and found a variety of abnormalities: deformed shells, defects in calcification, growth irregularities and parasites. Some shells had additional chambers, others had calcified protrusions such as knobs or swellings, while others had undersized chambers caused by a slowing or halt in the addition of chamber walls. 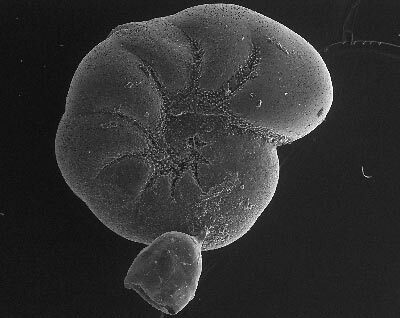 Many foraminifera shells had attached parasites. Based on samples collected before the spill and monthly samples collected from November 1978 to June 1980, the French researchers led by Vénec-Peyré found shell deformities and decreased growth rates for a year following the spill. Within one year after the spill, 21 percent of shells showed decreased growth rates, 8 percent were deformed and half were parasitized. The fact that in two years these numbers had declined nearly to pre-oil levels suggested that the oil pollution was responsible, although the cause — such as toxic compounds in the oil, oxygen depletion or decreased nutrients resulting from the oil slick — remains unclear. With funding from the France-Berkeley Fund, Vénec-Peyré, Lipps and their colleagues collected mud samples in April and May of 2010. The samples showed that forams were about comparable to pre-oil levels: The percentage of deformed P. paralium was about 3 percent, while 2 percent showed evidence of slow growth. The percentage of parasitized forams, however, was much higher — 15 percent compared to 4 percent before the oil spill – though significantly lower than the 50 percent parasitism rate a year after the oil spill. The researchers believe they are looking at ongoing pollution from boats and agriculture, not the lingering results of the Amoco Cadiz spill, while the high rate of parasitism may indicate compromised fitness due to stress. Other workers on the study were Michele Weber of UC Berkeley’s Museum of Paleontology and Annachiara Bartolini of the Muséum National d’Histoire Naturelle.